If your order weighs less than 13 ounces, save huge on shipping with USPS first class (with tracking number). This product weighs 2.5 oz. 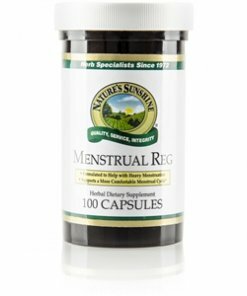 Nature’s Sunshine Menstrual Reg balances hormone levels during menstruation to help alleviate cramping, bloating, and mild mood changes. Lady’s mantle aerial parts, shepherd’s purse aerial parts, yarrow leaf, flower and aerial parts, black haw root, nettle leaves, sarsaparilla root, chaste tree fruit concentrate, and false unicorn root work together to provide general support for the female glandular and reproductive systems. Instructions: Take two to three capsules with a meal three times daily. 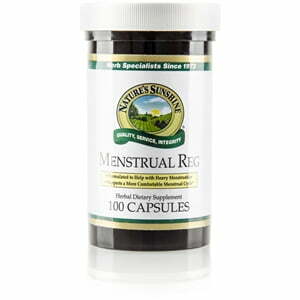 For a more immediate effect, it can be taken in larger amounts for short periods of time, for example, every two hours for a period of several days. For best results, this formula should be taken over a period of several months.